schuetzdesign: Apple - follower or leader - lifter or leaner? Apple - follower or leader - lifter or leaner? With the launch of iPhone 6 and Apple Watch, the question is whether Apple is an innovator rather than a follower - or in Joe Hockey's terms (Australia's Treasurer) a 'lifter' or a 'leaner'. I loved how everybody pointed out yesterday that there isn't a single feature on the "new" iphone that hasn't been standard on Android since 2012. So - I looked at some reliable tech blogs, and found out that by-and-large he was right. Is my faith, and apparent devotion (my business and I own 7+ Apple devices, and no longer have any PC's) misplaced? The lesson is that calling Apple a “follower” overlooks what it does best, which is wrap excellent usability into top-quality design, often alongside an innovative interface and then keep iterating to produce a hugely popular product that also wrings huge amounts of money from people. To the latter point, consumers seem satisfied with what Apple offers. Its shares of total sales in PCs and phones has ticked up steadily over the years. Its share of tablet sales is falling along with overall device sales, though that may be due to people simply not renewing them: tablets do not really wear out in the way that phones do. For those reasons, it is dangerous to dismiss what Apple does as “following”. Its track record, combined with the products it showed during its event on Tuesday, has the potential to have enormous and long-term effects. 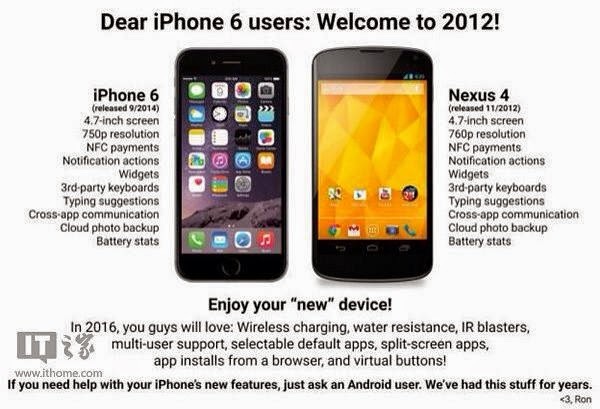 So maybe this Android versus iOS is another age old story. Like Betamax v VHS its quite often not the first to market or the most technically advanced that becomes the success? Kids and video screens - how young is too young?